Rev. Dr. Rickey L. Dugger, Sr.
Dr. Rickey L. Dugger is the Senior Pastor of the Norris Avenue Missionary Baptist Church in Memphis, TN. He is a distinguished, accomplished, charismatic Man of God who loves the Lord with all his being. This love is exemplified through his interaction with people from all walks of life. He is a loving pastor that definitely has the people at heart. Consequently, the NAMBC church family takes on the personality of our beloved pastor and has been established as a church that is located in the heart of the community and has the community at heart. Pastor Dugger is an advocate of education. He is highly educated and has attained several degrees throughout his lifetime. 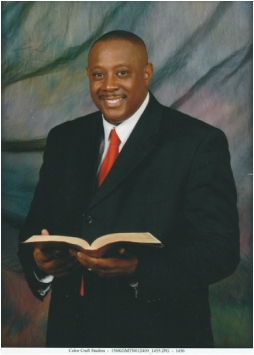 He has attended and attained degrees from Le Moyne Owen College (BA), Texas Southern University (MA in Sociology), Memphis Theological Seminary (MA in religion), and Jacksonville Theological Seminary (PhD in Religion). In addition to being highly educated, Pastor Dugger has also been an accomplished businessman and has been highly successful in the corporate realm. He has been employed with General Mills, Inc. for 34 years. He currently holds the position of Customer Account Lead for the National Wholesale Region and Associated Wholesale Grocers Division in the Southeast Markets of the United States. Pastor Dugger has been married to First Lady Patsy Dugger for 36 years. They are the parents of two wonderful children, Rickey L. Dugger Jr. (Wife - Lametria) and Gabrielle Sehar (Husband - David Sehar), and are proud grandparents of seven grandchildren, Alaiya, Rickey III, Selah, Cecelia, Autumn, Jahari, and Jaden. Pastor Dugger began his ministry at the NAMBC with 40 members in August of 1993. The membership has grown tremendously over the years. During his tenure the church established the NAMBC foundation and has been awarded a 501c3 designation which enables the church to sponsor Youth Programs and Outreach Ministries throughout the year for the Memphis Community. A few of these programs include the “Feed The Homeless Ministry” and the MIFA ministry. Together these programs are able to feed and clothe 50 to 100 men and women from various shelters each week. Outside of the NAMBC church family, Pastor Dugger is also very active. He has been a faithful member of the Memphis Baptist Ministerial Association, an organization of over 400 Memphis/Shelby County Pastors and Ministers. Within this organization, Pastor Dugger has served as the Finance Chairman over the past five years. He has worked with the Memphis Hamilton Alliance which works with the community and city training youth and young adults for their future. Additionally, he and First Lady Dugger also volunteer each year feeding the homeless during the holiday season. Some of the core values that drive his ministry are his beliefs in God’s word concerning Faith, Family, and Finance. He also believes in the old traditional saying, “It takes a village to raise a child”. He is also forever grateful and deeply appreciative to God for guiding him and his family over the years.